Well, sometimes the best-laid plans … you know? As I was watching the Oklahoma State-TCU game, I was keeping an eye on the score of the Baylor-Texas game, since I don’t get the Longhorn Network. All Texas did was take a little edge off of Saturday’s matchup in Waco, Texas, between Baylor and Kansas State. Like most, I felt even on the road Baylor had a good chance to beat Texas, and a win would have meant the Bears would host the Wildcats for solo supremacy in the Big 12. 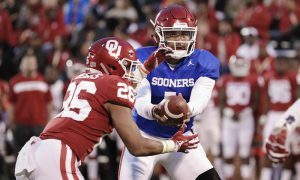 Both would have been tied for the league lead and it would have been a huge game not just in the Big 12 but around the country. But, like I said, best-laid plans … you know? Texas (13-10, 5-5 in Big 12) defeated Baylor (15-7, 6-3), 84-72, ending Baylor’s six-game winning streak. Meanwhile TCU defeated Oklahoma State, 70-68 and it was far more exciting than I’m making it sound. So what happened in Austin? Well at halftime Texas was up 15 points and much of that had to do with its shooting from the field. Texas hasn’t been a good shooting team all season. But at halftime the Longhorns were shooting 60 percent from the floor. I made the point on Twitter that was the primary reason for the lead because Baylor wasn’t playing poorly, it didn’t appear. Texas just seemed to be playing above its pay grade, so to speak. I assumed that what goes up must come down. Well, it didn’t. Texas ended up shooting 55.1 percent for the game. That’s terrific for an entire game. Plus the Longhorns were 40 percent from 3-point land. Plus, Texas got to the free-throw line 34 times. Frankly, they just outplayed the Bears. Texas also outrebounded Baylor, 33-30, and while the Bears’ starting lineup is the shortest in the Big 12, they’re a very good rebounding outfit. 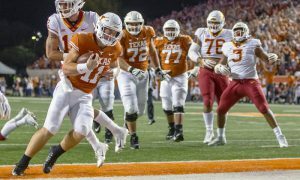 Texas led from nearly the beginning of the game and their lead was never unsafe. Kerwin Roach II had 21 points, Matt Coleman III had 18 points, Jaxson Hayes had 12 points and Courtney Ramey had 10 points. Dylan Osetkowski and Jase Febres had nine points each. 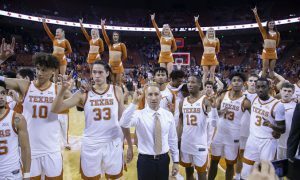 This was a big win for the Longhorns, and not just because they beat the Big 12 co-leader. They need as much help as they can get to stay off the NCAA Tournament bubble. The next step for Texas is to build on it, because they haven’t won back-to-back games in Big 12 action since starting 2-0. The Longhorns get a rematch with West Virginia on Saturday in Morgantown. As for Baylor, well there is no need to panic here. The Bears shot nearly 50 percent from the floor and nearly 40 percent from the arc. So in reality the Bears were just outplayed for the first time in nearly a month. It happens, especially on the road in the Big 12. Mark Vital had 14 points, Jared Butler had 13 points and Mario Kegler had 10 points. 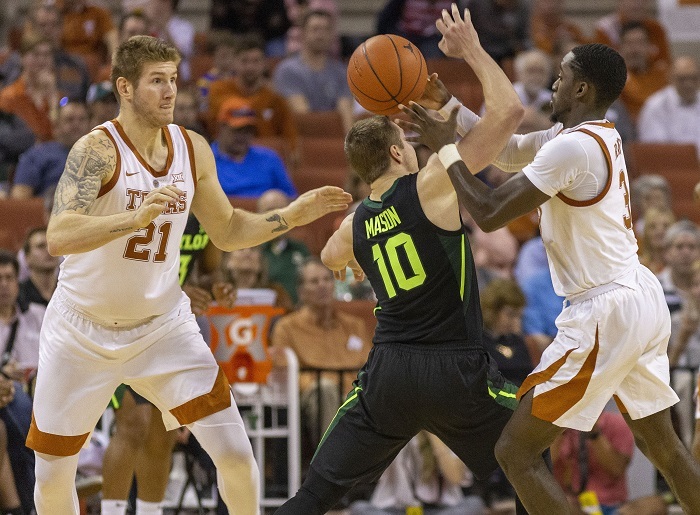 The Longhorns locked down point guard Makai Mason, allowing him just 5 points. Matthew Mayer added 10 points off the bench. Meanwhile, the game I was watching looked like it was going to be a blowout and it became a pulse-pounder. TCU (16-6, 4-5) needed a win after losing two straight. Oklahoma State (9-13, 2-7) wasn’t going to be a pushover. But after 20 minutes TCU had an 11-point lead and two Horned Frogs were having huge nights. 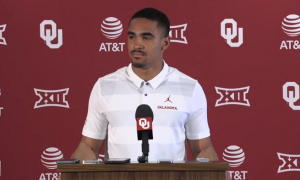 Desmond Bane decided he was just going to do it all himself at one point, scoring five 3-pointers in the first half (six for the game) and in doing so passed the 1,000-point mark for his career. He finished with a game-high 26 points. Guard Alex Robinson, meanwhile, ended up with 11 assists — to go along with 10 points — and passed Corey Santee as TCU’s all-time career leader in assists. Santee had to watch it from the bench. He’s a TCU assistant coach. So, yeah, at halftime it looked like Bane and Robinson were going to lead TCU to its eighth straight league win at home, their longest home winning streak in league play since 1999 (gulp). But Oklahoma State wasn’t going to make it easy. Not. At. All. It’s amazing the effort that head coach Mike Boynton Jr. is getting out of these Cowboys right now. 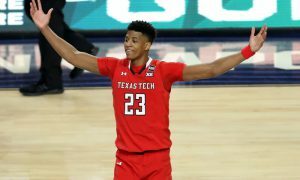 He used just six players against TCU and at one point his Cowboys went on a 24-4 run to take a 7-point lead in the second half. Guard Isaac Likekele — a nearby Arlington, Texas product — led that charge and ended up with 17 points. Forward Yor Anei — who had averaged 8.8 points per game in the previous five games — had a career-high 20 points. That’s an enormous development for these Cowboys, who haven’t had a consistent scoring presence inside, aside from Cameron McGriff. If Anei can give the Cowboys more games like this, he can become a real asset the rest of this season. He was perfect from the floor, by the way. 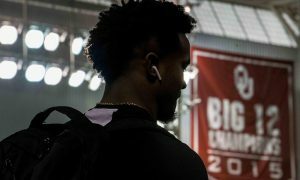 TCU scrapped back, of course. Kouat Noi had 12 points, JD Miller had 11 points and the Frogs bridged the gap late. TCU regained the lead with 1:11 left on a Bane layup. He then followed that up with two made free throws to give TCU a 3-point lead with 24 seconds left. Then Oklahoma State did this. Thomas Dziagwa is one of the best 3-point shooters in the league and he ended up with 14 points in this one. He made four from the arc. That basket came with 5 seconds left and tied the game at 68. 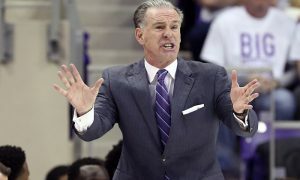 Miller drove the length of the floor and floated up a teardrop that fell through the net to give the Horned Frogs a 70-68 win. This was a big one for TCU. 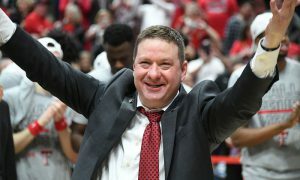 It not only stopped their losing streak but avoided that dreaded “bad loss” that guys like ESPN’s Joe Lunardi and CBSSports.com’s Jerry Palm look at. Falling to the Cowboys at home would have been the definition of a bad loss. As for Oklahoma State, they’re going to feel bad about this one. But there’s quite a bit to build on here, too. As mentioned, this Saturday the hope is that I’ll be in Waco for K-State-Baylor. Meanwhile, Oklahoma State has to go to Kansas, TCU is at Iowa State, Texas Tech heads to Oklahoma and Texas travels to West Virginia.